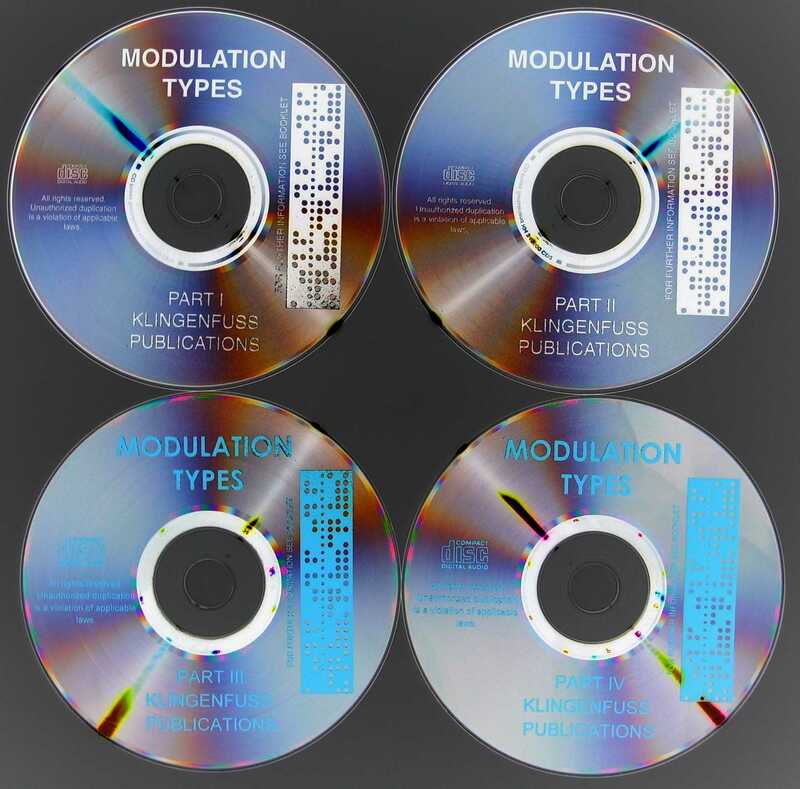 Reference signals of radio transmissions on audio CDs! These two double CD sets contain examples of various radiocommunication systems recorded by a professional monitoring service in Europe. 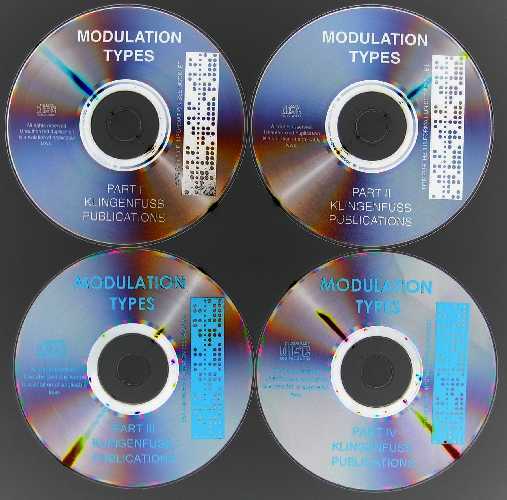 Four compact discs cover a total of 5 hours and allow rapid access to the typical sounds of all conventional and exotic shortwave transmission modes. Connect your PC, or CD player, to state-of-the-art decoding hard- and software and practice identifying and tuning these professional digital data transmission, teleprinter, radio paging and SELCAL systems. Synchronization is perfect as a result of digital recording techniques that prevent any speed deviations! By consequence, this set of CDs is the reference standard of many scientific dissertations and measurements, e.g. University of Nuremberg, Germany, 1997, "Implementierung und Evaluierung eines Klassifikators für Sprache und Nichtsprache auf einem DSP-Echtzeit-Betriebssystem" by Jörg Winter. Set 1 CD 1 and CD 2: 71 different examples on two CDs cover speech, Morse, digital data transmission, fax, and teleprinter systems such as ACARS, ALIS, Arabic, ARQ-E, ARQ-E3, ARQ-M, ARQ-N, ARQ6, ASCII, ATU-Arabic, AUTOSPEC, bit inversion, CIS, Cyrillic and third-shift Cyrillic, DUP-ARQ, FEC-A, GOLAY, HC-ARQ, HNG-FEC, IRA, ITA2, MCVFT, MFSK, NATO Link, Packet Radio, PACTOR, Piccolo, POCSAG, POL-ARQ, QAM, RUM-FEC, SI-ARQ, SI-FEC, SITOR, SPREAD, SWED-ARQ and TWINPLEX. The various recordings are listed separately. Set 2 CD 3 and CD 4: 123 new recordings on another two CDs. Covers ACARS-HF, ALF, ALIS-2, ARS-GUARD, ASCII-BUL, ASCII-Slovak, ATIS, AWACS-NATO, BR-6028, CALSEL, CIS-73, CIS-81, CIS 96, CIS-100, CIS-192, Clover-Marine, Clover-2, COQUELET-13, COQUELET-80, DataTAC 6000, DATATRAK, DGPS-GB, DGPS-I, DGPS-NL, DTMF, DUP-FEC-2, EATS, EFR, ERMES, FAF, FAX COLOR240, FAX FAF, FAX HAM-COLOUR, Feldhell, Fleet-Broadcast, FMS-BOS, G-TOR, GAF-FEC, GN-FEC, HARRIS RF-5710, Hell-45, Hell-Siemens GL72, HF-Datalink, HYPERFIX, ITU-Beacon, Joint STARS, KFF-58, LORAN-C, Manchester, MODACOM, MOI-I, MPTI 1327/1343, NATO Tone-Call, NMT450, NMT900, Packet Radio, PACTOR-1-2, PACTOR-1-4, PACTOR-1-6, PACTOR-2, Pager, Portugal-VFT, PSK31, RAC-ARQ, RADAR ATC/Interrogator/Transponder, Ripple Control, SELCAL systems: CCIR-1/CCIR-7/CCITT/CDCS/CODAN/EEA/EIA/EURO/FAF/GMDSS-DSC/ICAO/VDEW/ZVEI-1/ZVEI-2/ZVEI-VDEW; SSTV systems: MARTIN-1/ROB72C/SC.DX/SCOTT-1; T-PLEX, TMS-430, TRACK-BACK, TT2300, TWINPLEX, voice-encryption systems: ADPCM/CVSD/MicroPCM/RELP/Scrambler/Splitter/Vocoder; and much more.